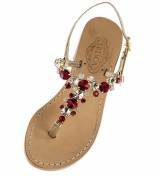 At Tresca, each sandal style is vibrantly different and exclusive. We want women to know that these sandals are as special as any unique piece of jewelry they own. 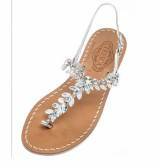 Wearing these exceptional sandals will put you in the company of celebrities such as Jackie Kennedy, Julia Roberts and Gwenyth Paltrow who have also have fallen in love with the jewel encrusted shoes. 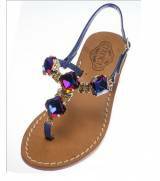 Tresca Italia was born when I went to Italy to visit relatives and fell in love with the Island of Capri and its sandals. In Italian, Tresca literally translated means tryst or a forbidden pleasure. 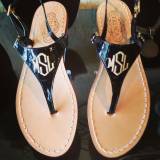 Monogrammed Ladies Italian Bella Sandals . 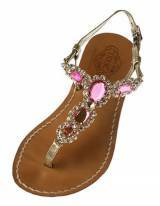 . .
Tresca Ladies Pink Metallic Leather Sandal . . .